House Republicans describe the Cut, Cap and Balance Act as a "common-sense plan to rein in the debt." Fiscal experts see it differently. NEW YORK (CNNMoney) -- It sounds so ... sensible. Force Congress to cut spending, cap it going forward, and balance the damn budget. Seriously, in an age of fiscal crazy, what's not to love? The Cut, Cap and Balance Act that the House passed Tuesday could end up exacerbating rather than curing budget problems. For starters, since the bill isn't expected to go anywhere in the Senate, lawmakers are wasting precious time needed to pass a debt ceiling increase before Aug. 2. Without an increase, the largest economy in the world would put itself at risk of default and further economic decline. And even if the bill were to make it out of Congress, President Obama has promised to veto it. As for the substance of Cut, Cap and Balance, getting the country's fiscal house in order is a noble goal. But the measures in the bill -- particularly the call for a balanced budget amendment to the Constitution -- are unlikely to achieve that end. 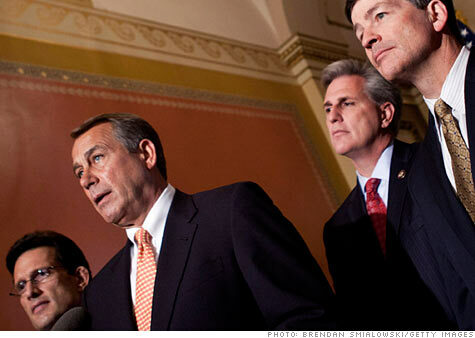 Cuts spending too fast: The House bill would cut total spending by $111 billion for fiscal year 2012. While that represents less than 1% of the economy, the timing of the cuts might further weaken the recovery. Congressional Budget Office Director Douglas Elmendorf told the House Budget committee in June that a $100 billion cut next year is "enough [to] affect our projections for GDP growth over the next few years." Creates needless distraction: It could take years for Congress and the states to debate and approve a balanced budget amendment to the Constitution. That time would be better spent actually debating and approving entitlement and tax reform, said Robert Bixby, executive director of the Concord Coalition, a deficit watchdog group. "We should be spending our time doing that instead of taking our time to amend the Constitution to force us to do that," he said. Too vague in parts: The bill calls on Congress to pass a balanced budget amendment. But it doesn't say which one. Instead it gives broad blessing to any of three proposals already put forth in the House and Senate and to any comparable alternative. Given that the existing proposals differ in key ways, it will be impossible to assess what exactly those who vote for Cut, Cap and Balance are really supporting. And when it comes to amending the Constitution, details matter ... a lot. Too specific in others: Bixby doesn't fundamentally object to the idea of a balanced budget amendment so long as it stands up for the broad principle of balanced budgets and doesn't prescribe how future Congresses achieve them. The House bill goes beyond the principle and sets specific spending caps and high hurdles for passing tax increases. Too stringent on spending: The balanced budget proposals would cap spending at 18% of GDP -- although they don't define GDP consistently. Keeping spending at 18% is a very hard target to meet given the growing demand for Medicare and Social Security as the country's population ages. How hard? Former CBO Director Rudolph Penner notes that by 2035, spending on Medicare, Social Security and interest on the debt is likely to account for 14% of GDP. Under an 18% spending cap, that would leave 4% to pay for everything else. Consider that the United States today spends 4.7% of its GDP on defense alone. And requiring spending and taxes to match up evenly would make it hard to respond to downturns, when demand for government spending rises and revenue falls. That would "dramatically impede" efforts to fund lifeline support like unemployment benefits and food aid, the House Budget Committee's Democratic staff said in a memo. Too inflexible on taxes: The Cut, Cap and Balance bill would impose a very high barrier to approve any tax increase, requiring a two-thirds vote -- or supermajority -- in both the House and Senate. The reason why fiscal experts on the left and right have said a long-term, credible debt reduction plan must include both spending cuts and tax increases is because it's simply too hard economically to do just one. If lawmakers want to permanently freeze the debt held by the public where it was earlier this year -- around 62% of GDP -- they would need to immediately cut spending by 35% or about $1.2 trillion, according to the Government Accountability Office. And those cuts would need to be permanent. That's nearly as much as the country spent on all of its discretionary spending -- including defense -- in 2010.